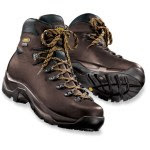 If you have a new pair of hiking or winter boots, make sure they fit properly. If they don’t, return them immediately for a better fitting alternative. Here’s what to look for. First, don whichever socks you expect to wear with your new boots. Next, identify your longer foot (most people have one foot larger than the other). Loosen the laces of the corresponding boot and slide your foot inside. Leave the boot unlaced, stand up, and push your foot forward until your toes touch the end. Now lace up your boot and evaluate the boot for width. If your toes or the sides of your feet are painfully crunched, the boot is too narrow. If you can slide your foot from side to side inside the boot, then the boots are too wide and may cause blisters on the bottom and sides of your feet. If they boots are snug, but not uncomfortably so, then you should be fine—most boots will stretch enough to ensure a comfortable fit. Your heel should be locked in position inside the boot and not slide up or down as you walk (the number one cause of blisters). When lacing your boots, leave the area over the top of your foot loose but cinch down tightly across your ankles to secure your heel in place. Walk around and stand on your toes to check for heel lift. Ideally there should be none, though a small amount of movement (quarter-inch or less) is considered acceptable. When it comes to length, boots fit—or they don’t. There’s nothing you can do about it except trade in for a different size. When it comes to width, you can wear thicker or thinner socks if the fit is just a little bit too wide or narrow. If the width is tight, but not painful, be aware that leather boots will stretch significantly more than synthetic alternatives and fit better the more you use them. If your heel continues to slip even after tightly cinching the laces, consider swapping out the existing insoles for a pair of after-market insoles like those from Superfeet. Look for models that take up extra room in the boot, such as the “Green” insoles from Superfeet. This can help eliminate some of the extra space around your heels that’s causing them to slip in the first place. Remember: Returning a pair of ill-fitting boots might be inconvenient—but it pales in comparison to the long-term misery brought on by wearing the wrong pair.